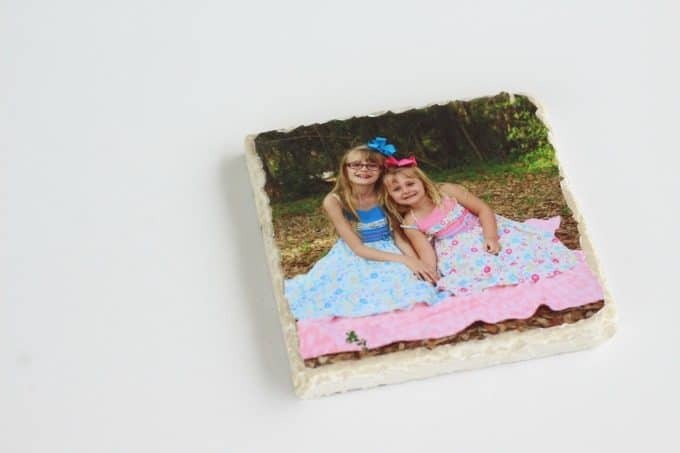 Looking for a great gift or just a fun way to display your photos? 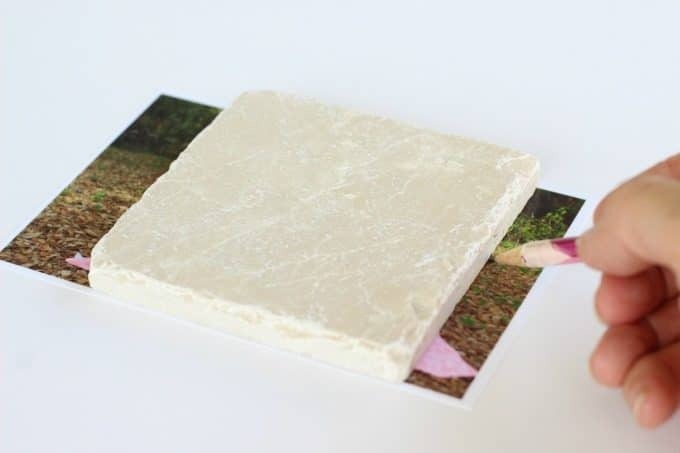 These DIY Tile Photo Coasters are both pretty and practical! When I taught Kindergarten, we loved to make photo gifts for the parents. 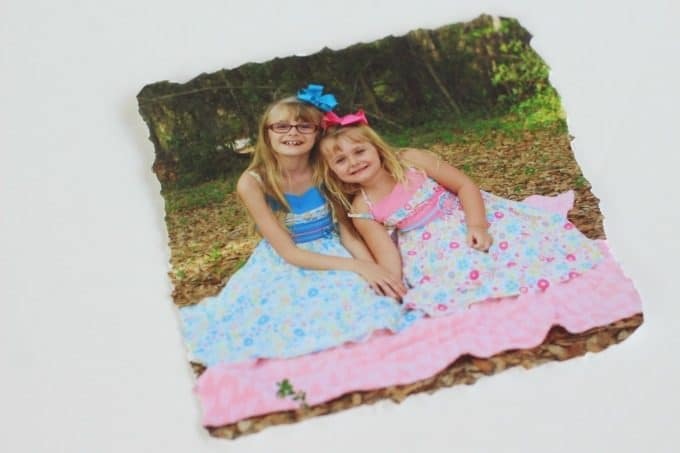 They were perfect for Christmas, Valentine’s Day, Mother’s Day and any other occasion when we needed a gift. 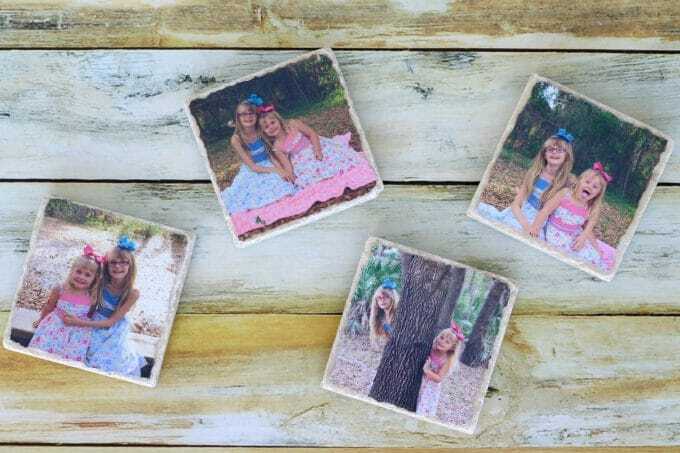 One of my favorites were these photo coasters because not only were they cute, they were easy for the kids to make. Start by finding four of your favorite 4×6 photographs. You’ll also need four 4″x4″ tiles. 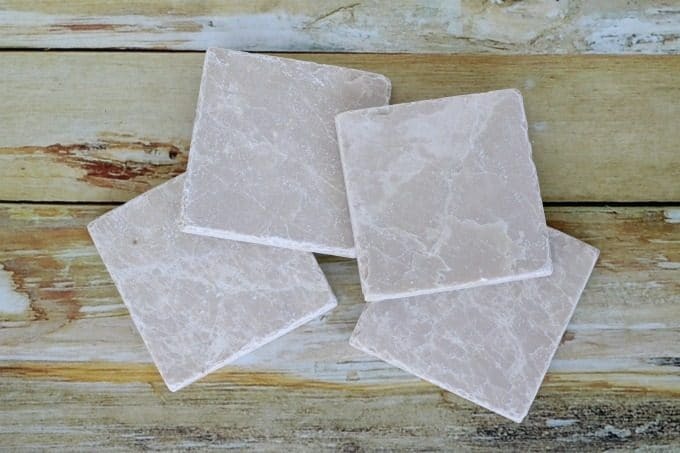 I like these stone ones and the price was right…$.52 each. (One of my favorite things about this project is that it’s so inexpensive!) You’ll want to use a damp cloth to clean the tiles. 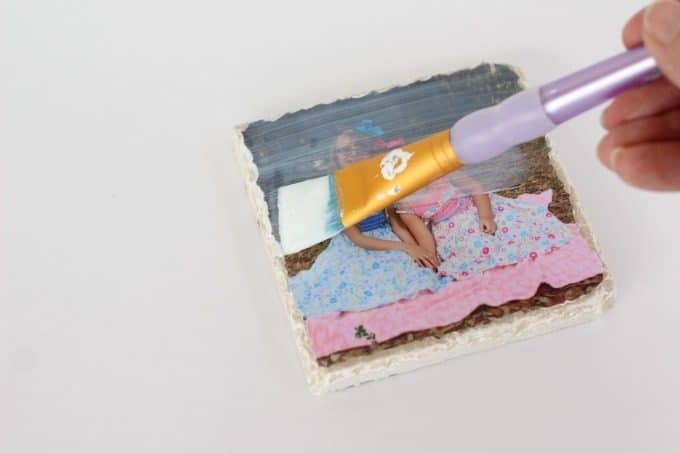 Lay a dry tile over the top of your first picture and trace. Do the same for the other three pictures. Once you’ve traced around the photo, you have two options. 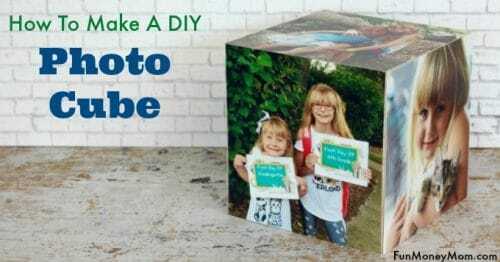 You can use scissors to give your photo a straight edge or you can tear along the lines to get more ragged edges. You also want to make sure that the photo is slightly smaller than the tile. 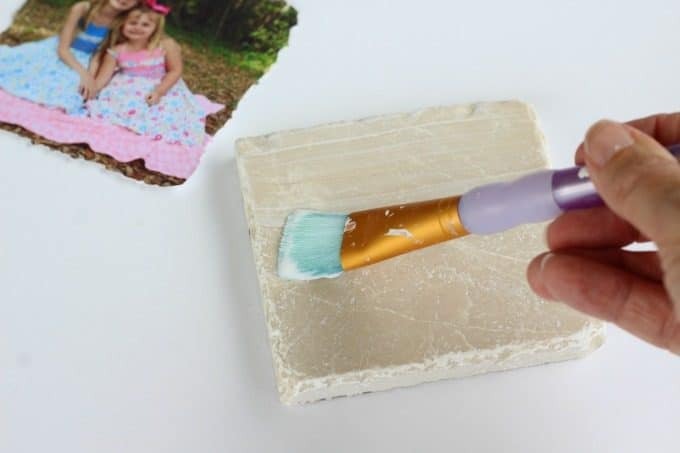 Paint the surface of the tile with Modge Podge. Lay the picture over the top and smooth out any air bubbles. It’s best to give it some time to dry completely but you can continue to the next step if you don’t want to wait. Next, paint over the top of the photo with more Modge Podge. 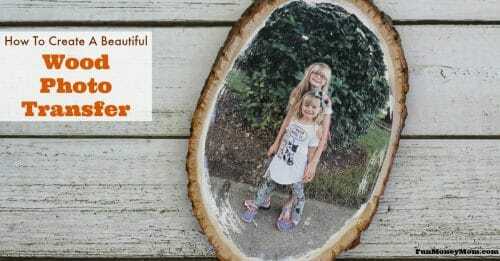 If you didn’t give it time to dry, just be sure to hold the photo in place so that it doesn’t slide around. Once the first coat dries, you can add a second one for extra protection and let them dry overnight. 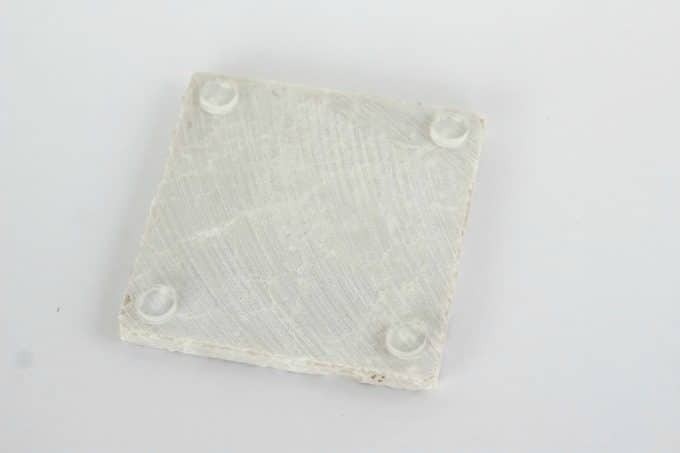 Finally, you’ll want to use something on the bottom to keep the tile from scratching your table. I usually use little felt circles but just happened to have these rubber bumpers on hand this time. Now you’re ready to enjoy your new coasters. I have to admit, this picture is my favorite! It kind of shows of both girl’s personalities. Keira is the silly, outgoing one and Ashling just kinds of hangs out in the background, entertained by her little sister’s antics! 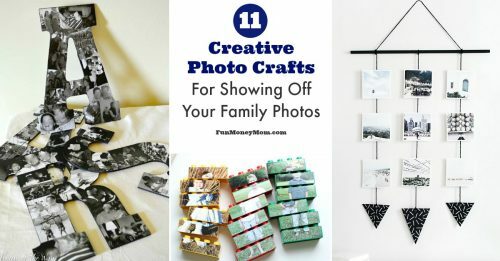 These make such great gifts and I even made some for my mom awhile back. 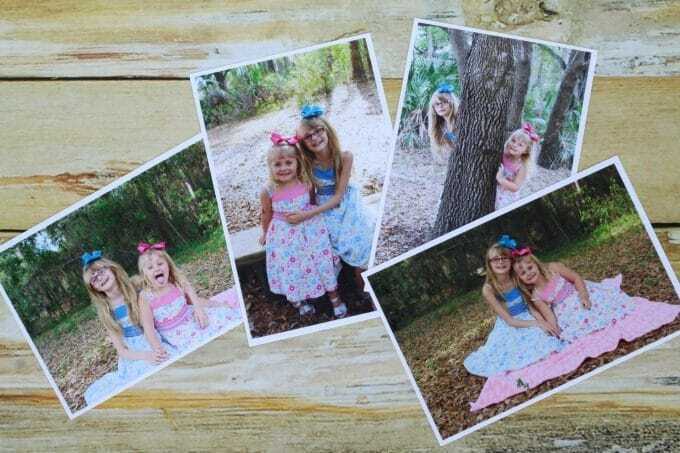 I learned a long time ago that I can give her anything with a picture of my girls on it and she’s happy! However, she loved these so much that she didn’t want to mess them up by putting drinks on them and uses them as decor instead. Even though I hadn’t initially thought of that, they really do look pretty as artwork! 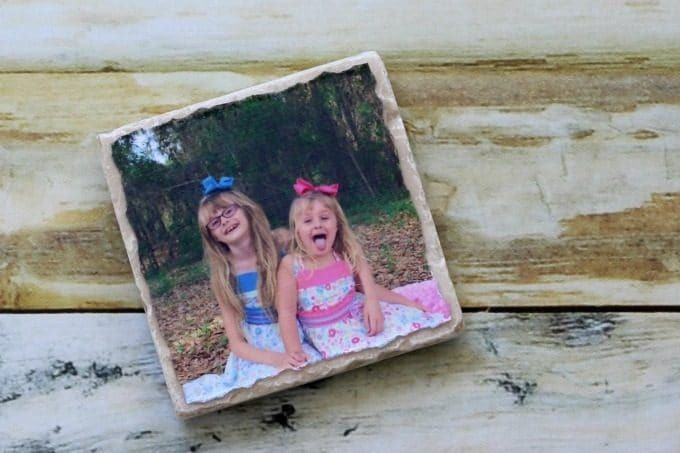 What would you do with your tile photo coasters? Would you rest your drinks on them, use them as decor or give them away as a gift?